Got your spring fever on? The warm spring weather is perfect for an exterior upgrade. New windows help you prepare for the hot summer days to come. Bring a fresh look to your home with replacement windows from Renewal by Andersen® of St. Louis. Don’t have second thoughts on window replacement. Here are four reasons why you should do it this spring season. 1. Enhanced energy efficiency. Once the summer hits, you want your home to keep cool all day long. With St. Charles, Missouri, energy-efficient windows, you can avoid too much use of your air conditioning. Less energy consumption helps save money on electric bills. 2. Most durable materials. Summer heat can damage the exterior components of your home. Our replacement windows are made of the most durable material in the market: Fibrex®. It is as strong as wood and is low-maintenance like vinyl. Our windows can withst and any element and last a long time. 3. Added curb appeal. Spring is the best time to give your home a fresh look. Our replacement windows come in several colors and designs that will match any architectural style. We also offer elegant hardware, chic finishes, and several grille patterns to make your window more appealing. 4. Added property value. Remodeling magazine’s 2015 “Cost Vs. Value” report found that window replacement can have a payback of up to 78.8%. 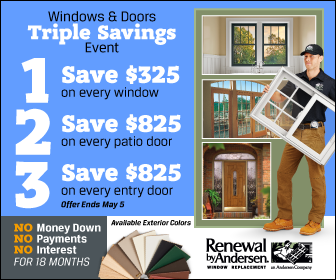 By choosing windows from Renewal by Andersen of St. Louis, you can save money on energy consumption and maintenance fees. You should be worry-free when summer comes along. Call us today to get an energy-efficient, low-maintenance, and durable windows for your home. Renewal by Andersen windows installation in St. Charles, MO, come with Fibrex and High-Performance™ Low-E4® glass. These materials block heat transfer better than other materials in the market, reducing heating and cooling costs. If you’re worrying about maintenance, Fibrex frames are available in several colors that will not fade even when they’ve had too much sun exposure. These will also not rot, flake, blister, peel, or corrode. For added protection from the elements, you can ask us if your new windows come with TruScene® insect screens. You can get a free in-home estimate when you call us at (314) 332-2364. You can also fill out our contact form here.